U.S. News recently reported that women such as MBA degree candidate Charlene Assam are in good company at SUNY Oswego, which placed No. 5 nationally on the media corporation's Short List of MBA programs with the highest percentage of women students. Oswego's MBA programs enroll nearly 53 percent women. OSWEGO — In an era when many schools of business struggle to attract women students, SUNY Oswego’s MBA program placed No. 5 nationally on a U.S. News Short List for enrolling the highest percentage of women — nearly 53 percent during fall 2016. U.S. News recently reported that women such as MBA degree candidate Charlene Assam are in good company at SUNY Oswego, which placed No. 5 nationally on the media corporation’s Short List of MBA programs with the highest percentage of women students. Oswego’s MBA programs enroll nearly 53 percent women. In announcing the list of just six colleges and universities with enrollments of more than half — and four with nearly half — women in MBA programs, U.S. News reported that fewer than 40 percent of full-time MBA students enrolled at ranked business schools nationally were women in fall 2016. Female students were in the minority at 122 of the 130 ranked business schools that provided gender-ratio statistics to U.S. News in an annual survey. Irene Scruton, director of MBA programs at SUNY Oswego’s School of Business, said there are several factors at play in the attractiveness to women students of the college’s master of business administration degree programs, among them: a nationally ranked all-online program and other flexible options, the lakeside main campus and a Syracuse branch campus, highly regarded women among the faculty, a diverse student body, availability of internships, affordability and accreditation from the Association to Advance Collegiate Schools of Business. 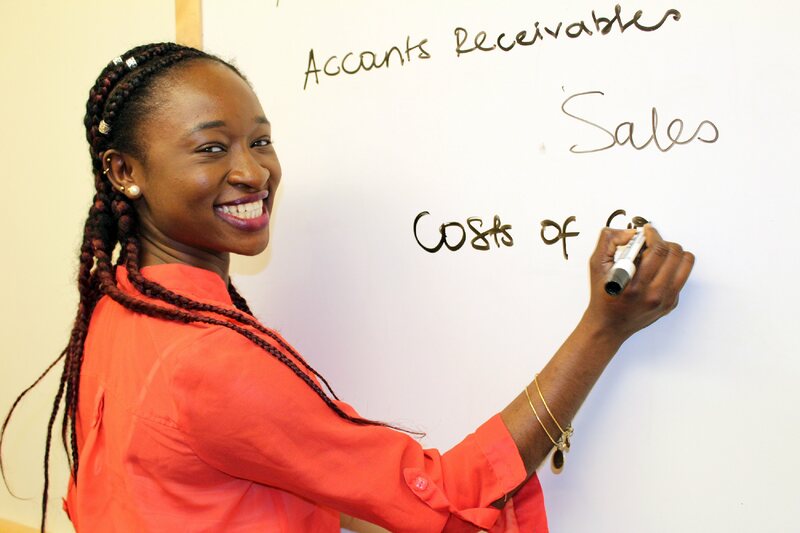 MBA candidate Charlene Assam, who will complete her degree in May after also earning a bachelor’s degree in accounting at Oswego, will start as a core assurance associate at PwC — also known as PricewaterhouseCoopers — in New York City after graduation. She welcomed the diversity she found in her classes. SUNY Oswego was joined on the U.S. News Short List for percentage of women enrolled in MBA programs by Missouri University of Technology, University of Colorado-Denver, San Diego State University and several others. The affordability of a SUNY Oswego MBA took center stage in another U.S. News Short List, this one listing 10 business schools where those earning MBAs had average starting salaries well above the average amount of MBA student debt. Oswego’s salary-to-debt ratio was nearly 3:1. The data for the short lists rises from U.S. News’ respected and oft-cited survey of 471 schools in its 2016 survey of business programs. Among other areas of interest to prospective students, schools self-reported myriad data regarding their academic programs and the demographic makeup of their student body. For more information on earning an MBA at SUNY Oswego, visit oswego.edu/mba, email [email protected] or call 315-312-2911.